NOAA's magnetic declination calculator is here. Magnetic declanation is the difference between magnetic north and true north. Berkeley's declination is 14° 16' E. This is useful information for calibrating your compass or your GPS. Most GPS allow bearings to be calculated on either true or magnetic north, even the lowly iphone compass allows this. ESRI has just launched a public beta version of their online mapping service on arcgis.com. 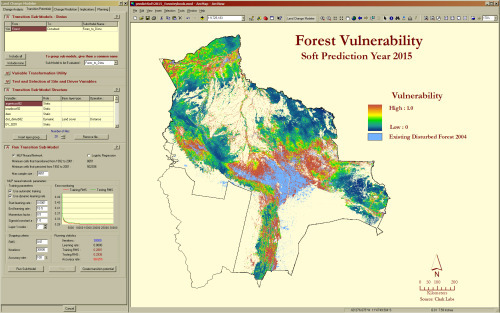 At the ArcGIS.com site, you can browse featured ArcGIS Online content such as maps and applications published by ESRI and the ArcGIS community, and add comments and ratings. You can upload and share your own items, either with specific groups that you created or are a member of, or you can share your items publicly. Use the newly designed Web Mapping application to quickly create online mashups that you can also share with others. The design and interface is nicely done, and includes easy access to many of ESRI's online basemaps. This site launch coencides with a greatly updated version of ArcGIS Explorer which provides a much improved free GIS viewer, tightly integrated with ArcGIS desktop layers and outputs. Ryan Branciforte at the Bay Area Open Space Council reports on their new web tool: Transit and Trails. The new interactive website identifies more than 500 trailheads and 150 campgrounds in our region’s 1.2 million acres of preserved lands. Just enter your starting location at Transit and Trails’ Google Maps-powered site, and select the radius. Once you’ve picked your ideal trail from the results, Transit and Trails will open a new link in 511 Transit Trip Planner, where you’ll find a detailed trip itinerary, complete with a map, transit times, fares, and walking directions to and from the transit stop. Very cool. 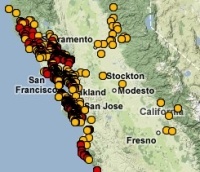 Related news: from the SF Chron, SF Hostels, mother nature network, & triple pundit. Having just set up a HOBO weather station over the weekend (ain't she pretty? ), and being dismayed at having to use my windows computer to control it, I wondered about other ways to monitor the environment. Amazingly, but perhaps not surprisingly, there are many new iPhone apps out there for us to investigate. For example: the recent NPR study about soil moisture monitoring via the iPhone is interesting. The sensors themselves are very expensive, but are monitored via an iPhone app. Also: this new Wind Meter app, which I am going to test at lunch today. Seems fun, but a far cry from a real anemometer. And of course: we will soon be releasing our OakMapper iPhone app. I just came across a helpful bibliography of GIS literature created and maintained by ESRI. It indexes journals, conference proceedings, books, and reports fro the origins of GIS to the present. There are currently 78,400 entries. You can't download all articles directly from the site, but the keyword search is really helpful to get a list of articles on a particular topic that would be good to look into. The Federal CIO Coucil has just launched Data.gov, a site that brings all federal data into one searchable place. You can directly download xml, csv, kml/kmz, and shp files and find links to tools for finding other data. "Created as part of the President's commitment to open government and democratizing information, Data.gov will open up the workings of government by making economic, healthcare, environmental, and other government information available on a single website, allowing the public to access raw data and transform it in innovative ways. Such data are currently fragmented across multiple sites and formats—making them hard to use and even harder to access in the first place. Data.gov will change this, by creating a one-stop shop for free access to data generated across all federal agencies. The Data.gov catalog will allow the American people to find, use, and repackage data held and generated by the government, which we hope will result in citizen feedback and new ideas. Data.gov will also help government agencies—so that taxpayer dollars get spent more wisely and efficiently. Through live data feeds, agencies will have the ability to easily access data both internally and externally from other agencies, which will allow them to maintain higher levels of performance. In the months and years ahead, our goal is to continuously improve and update Data.gov with a wide variety of available datasets and easy-to-use tools based on public feedback and as we modernize legacy systems over time. Democratizing government data will help change how government operates—and give citizens the ability to participate in making government services more effective, accessible, and transparent." 1. Go to ArcGIS Online Resources to quickly, easily, and freely add in terrific basemap data and high res imagery to any .mxd. If you are logged in you will have access to a lot more options. 2. Arc 9.3.1 (to be released any day now) will include a "layer packages" feature. So, if you want to send someone your file exactly as you are looking at it, you can right click on the layer and select "save as layer package", and it will zip the .shp + .lyr into a .lpk to share more easily. Also, there will be free access to Microsoft Virtual Earth within your Arc desktop. "After Google, What?" was the name of a course at the iSchool, but Paul Smith of EveryBlock has asked the same of Google Maps. His answer? An open source web mapping stack. Check out his cool article on A List Apart, "Take Control of Your Maps". If you haven't checked out EveryBlock, do so. Their maps are beautiful. We use a lot of these technologies in the lab and in the GIIF, with the exception of Mapnik, which, to my shame, I've tried and failed to install. Update Some responses: a thread on geowanking including a response from Google evangelist Pam Fox, and discussion and response from the author on ALA (for some reason the post isn't on Technorati yet...).